One of my father’s photos of the Horn Tavern has been in the blog header since I started the blog, and today I finally get round to covering the location. He took two photos of the rather ornate light on the corner of the Horn Tavern which was at the junction of Sermon Lane and Knightrider Street, just to the south of St. Paul’s Cathedral. This is the same view today, the frame of the light is still there, however there have been some changes to the pub and the surrounding streets have changed significantly. The differences in the photos highlight what has happened to the pub since my father took the original photo. The pub had a long history as the Horn Tavern, with references to the pub going back to the 17th century (although it is sometimes difficult to confirm that whilst the name may be the same, it may not be the pub at this location). 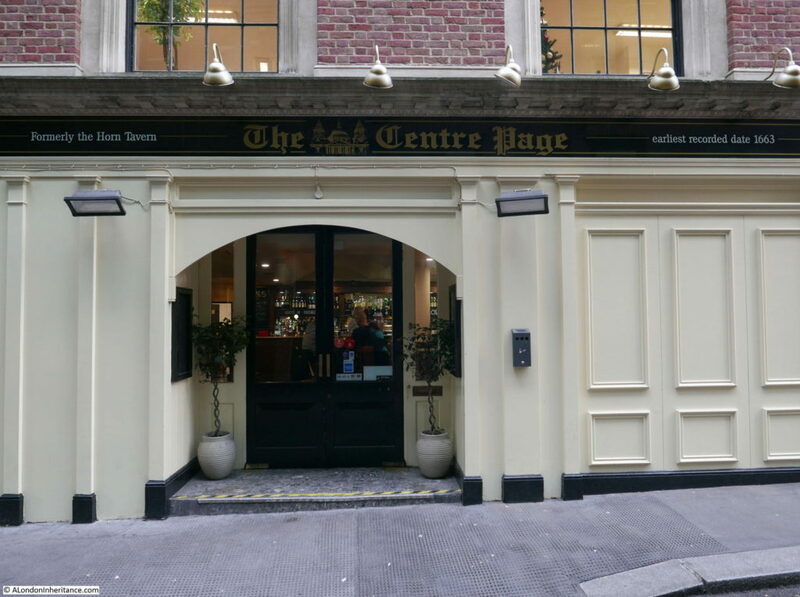 The pub changed its name to the Centre Page in 2002. I have no idea why the name changed, or the meaning behind the current name. 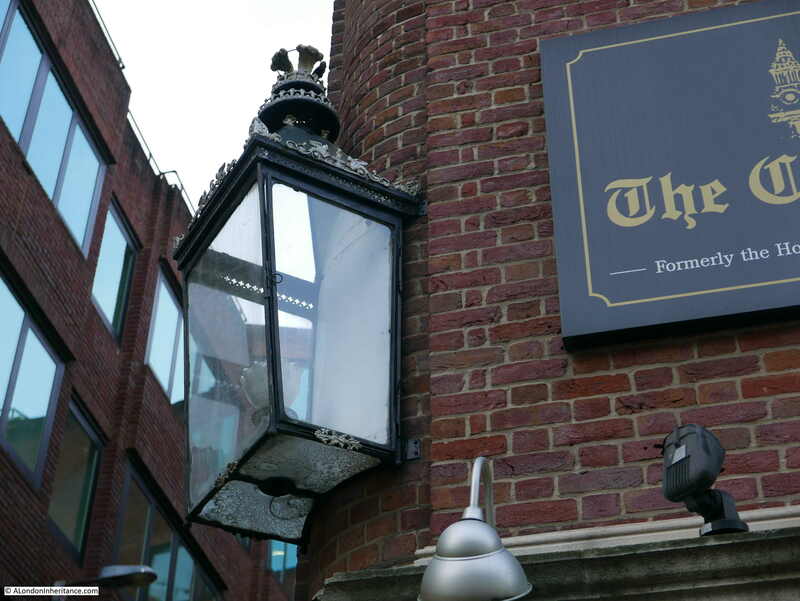 I would have thought that a name as old as the Horn Tavern would have been preferable, especially given the location on the walk up from the Millennium Bridge to St. Paul’s with the attraction of an old name to the passing tourist trade. 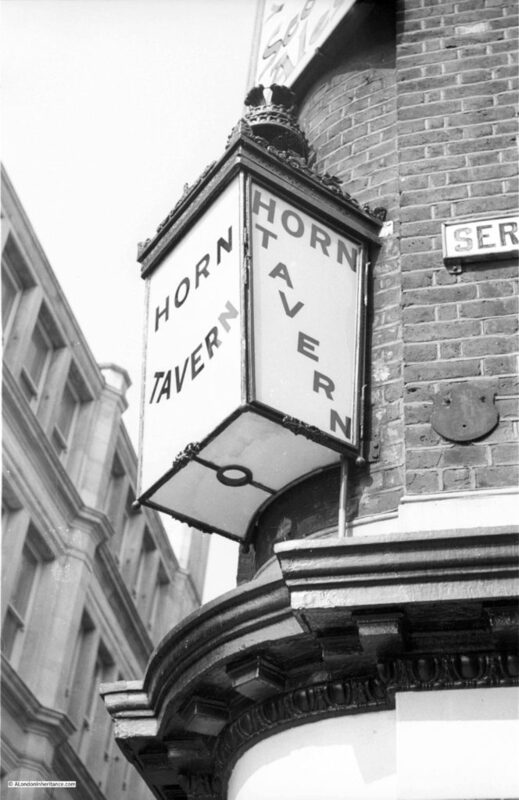 I will continue referring to the pub as the Horn Tavern as I much prefer the original name. The frame of the light in my father’s photo looks to be the same as the light in place today, however the wonderful glass with the pub name has been replaced with rather bland clear glass. The original light must have looked brilliant and very inviting when lit on a dark London night. There have been many changes in the immediate vicinity of the Horn Tavern. In my father’s photo, the name plate for Sermon Lane can be seen. Sermon Lane still exists but only really in name rather than as a lane. To set the location and changes in context, the following map shows the area today. Peter’s Hill is a wide walkway from Saint Paul’s Church Yard down to Queen Victoria Street. Just over half way down on the left can be seen Knightrider Street. Where this meets Peter’s Hill, the Horn Tavern is on the upper corner of the junction. There is a truncated street running up and down from this junction and within Peter’s Hill can be seen the words Sermon Lane. Peter’s Hill is one of the major changes to the area. 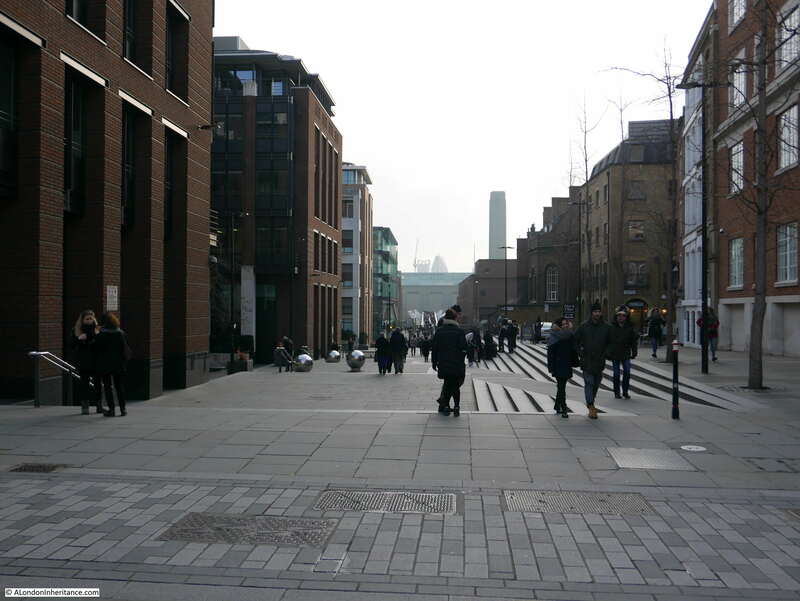 The area between the cathedral and the river was once densely packed with office buildings, warehouses etc. Peter’s Hill carved through these buildings and streets to provide a wide pedestrian walkway from river to cathedral and opened up the view of the cathedral from the river and Bankside. The following map is from the 1940 Bartholomew Atlas of Greater London. 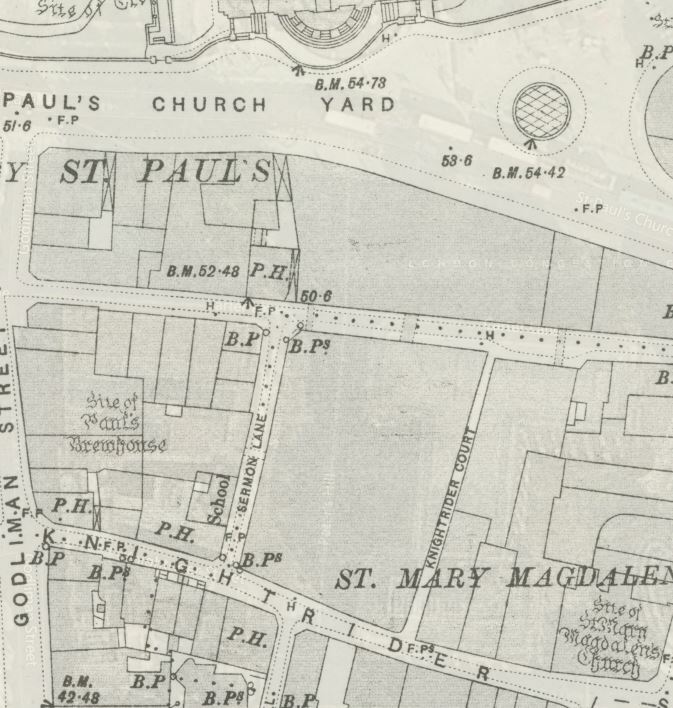 In the middle of the map can be seen Sermon Lane, when it was a street with buildings on either side. 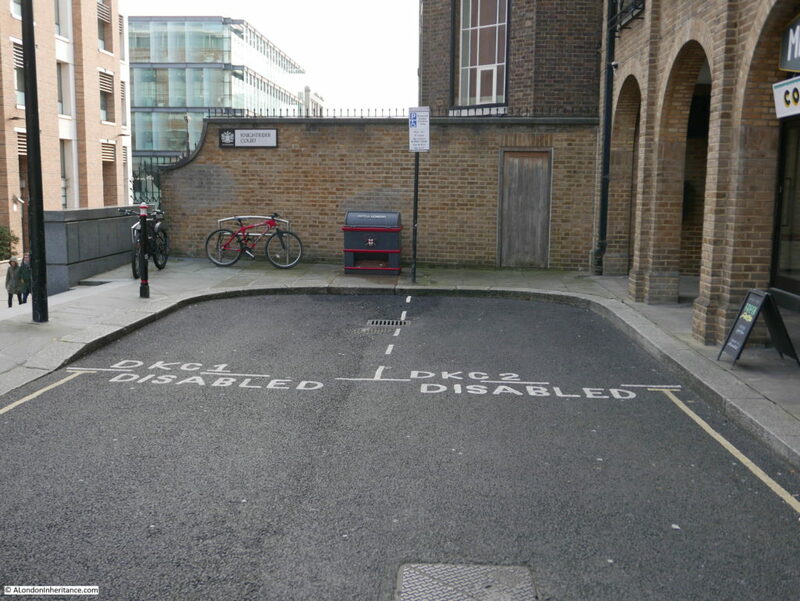 To the right of Sermon Lane is Knightrider Court – this has had a strange move which I will cover later in this post. 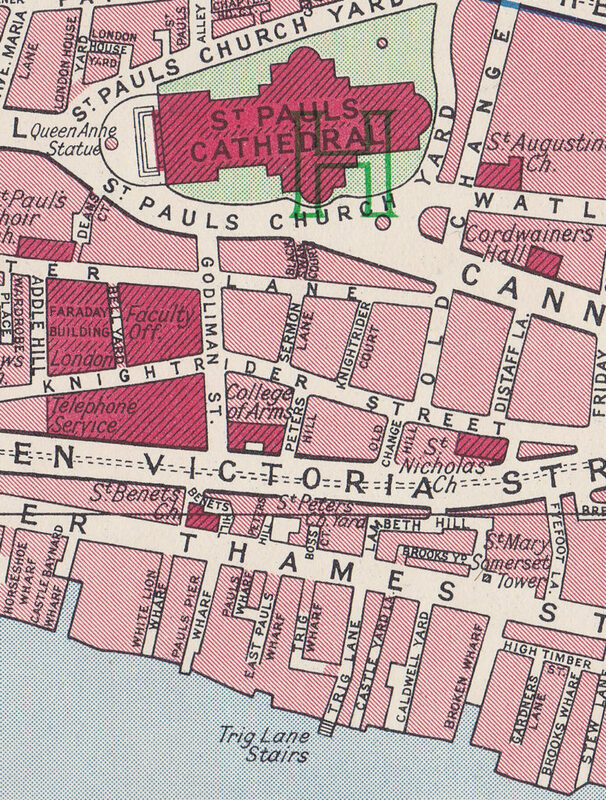 The 1895 Ordnance Survey map shows the area in more detail. The Horn Tavern is the P.H. on the corner of Sermon Lane and Knightrider Street. 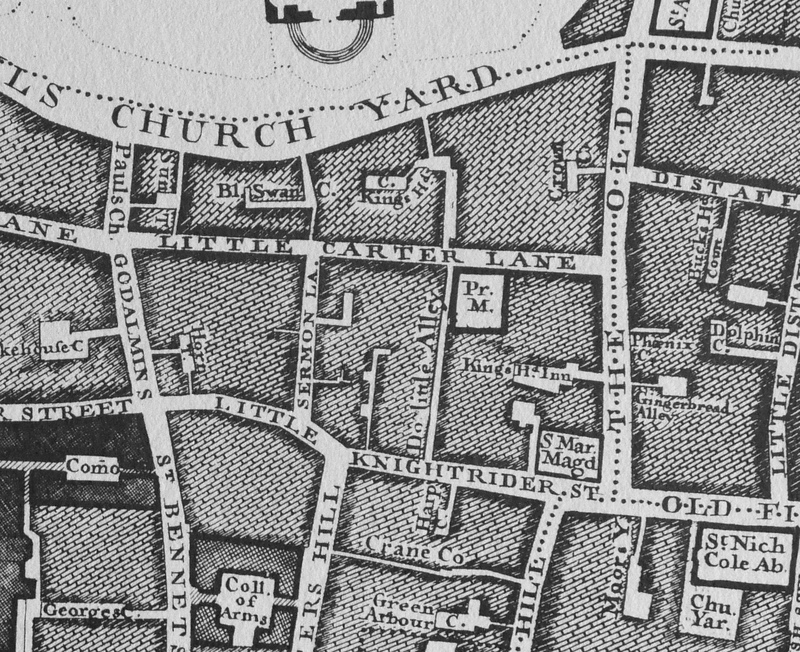 Going back further to Rocque’s 1746 map, we can still see Sermon Lane, however to the right, Knightrider Court was then called Doolittle Alley (the second ‘o’ is missing from the map). I had assumed the origin of the name Sermon Lane was religious given the proximity to the cathedral, however the London Encyclopedia states “perhaps named after Adam Sermoneinarius, a 13th century property owner, or since it was once known as Sheremongers Lane, its name may have come from the sheremongers, who sheared or cut, and rounded the silver plates used in the minting of coins”. There appears to be a common explanation leading back to John Stow’s Survey of London for the name Knightrider Street and Court. In the Streets of London, Gertrude Rawlings states that “Stow says it was supposed that the name refers to knights riding this way from Tower Royal to the tournaments at Smithfield. It has also been stated that a “knightrider” meant originally a King’s messenger, but no such word is known in our dictionaries”. Photos of the area today show the changes to these streets. 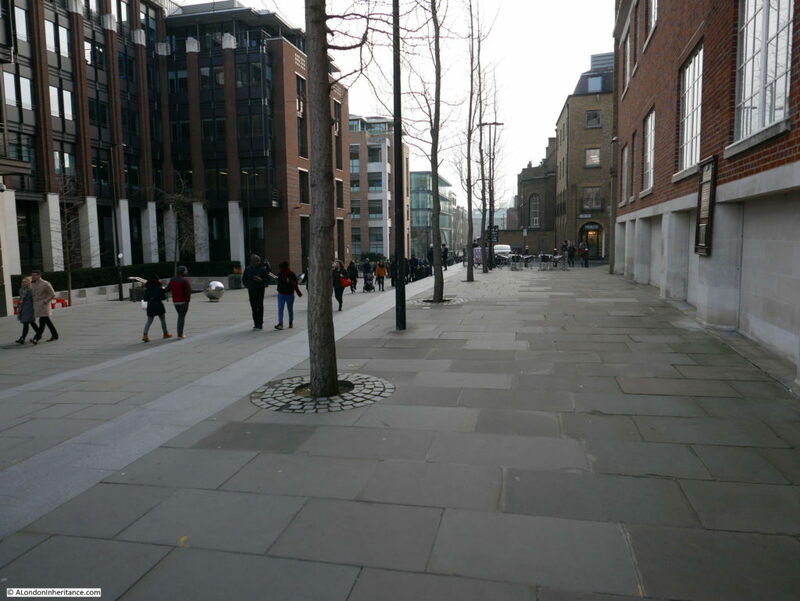 In the following photo, the Horn Tavern is on the corner and the paved area edged by the trees, leading up towards the cathedral is Sermon Lane, however this is all open space and the steps on the right form the only boundary with Peter’s Hill. A large sign on the corner of the pub documents a link with Dickens and also states that the pub was formerly known as the Horn Tavern – again why change, there is even a Dickens reference to the original name. 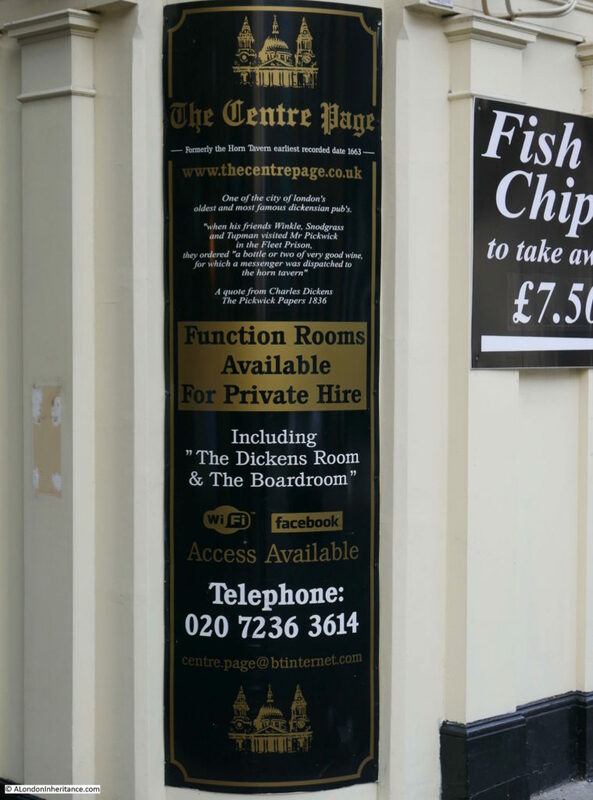 View of the entrance to the Centre Page in Knightrider Street – again with the reference to the former name. The current Horn Tavern building dates from the 19th century. Remarkably with the level of destruction around St. Paul’s Cathedral, the building survived the blitz. 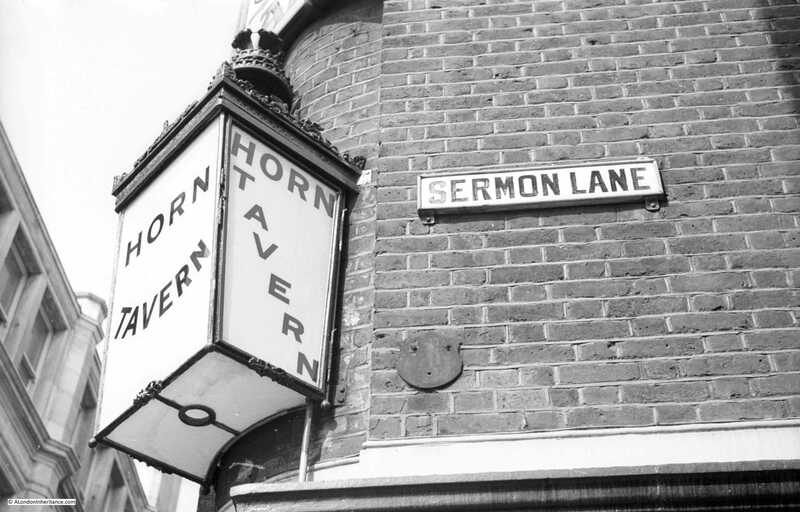 The Horn Tavern appears in newspapers over the years for all the usual reasons – the meeting place for clubs, adverts for staff and rooms, people staying in the tavern being involved in local events etc. In October 1874 there was a rather intellectual contest held between teams from north and south of the river when twelve of the best players from the City of London Chess Club, played against twelve of the best players from the Bermondsey Chess Club. Unfortunately I cannot find any results to confirm whether the north or south of the river came out on top. This is the view looking down what was Sermon Lane from the end near the cathedral. This space still retains the name Sermon Lane, however it is only a line of trees and steps that separate Sermon Lane from the main part of Peter’s Hill. Looking down from the centre of Peter’s Hill, Sermon Lane is on the right. 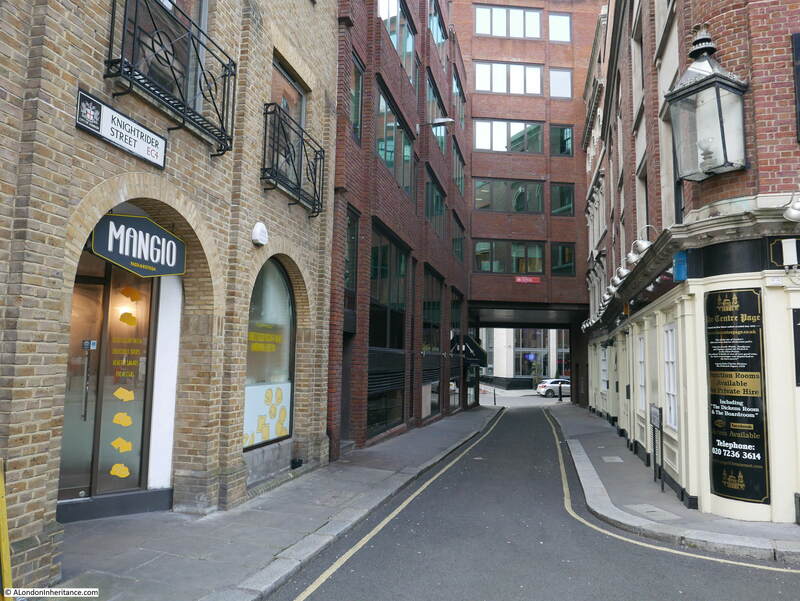 In the above photo, Knightrider Court once ran through the buildings on the left, as can be seen on the 1940 and earlier maps, and Sermon Lane terminated directly on Knightrider Street, however fast forward to today, and Knightrider Court has moved. The name is now used for the small section of street from just before the pub, and includes a small space after the junction with Knightrider Street. 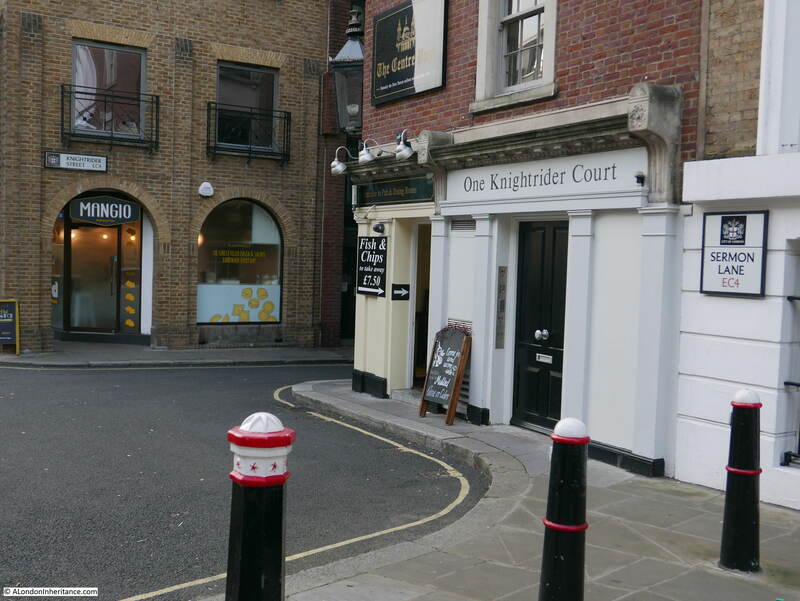 In the following photo, One Knightrider Court can be seen above the entrance to the building to the right of the Horn Tavern (although today it is separate, this entrance and the building above was part of the Horn Tavern). From the above viewpoint, turning slightly to the left and looking straight down there is this small length of street which also has the name Knightrider Court. So although the original Knightrider Court has been lost, the name has transferred to take over the end of Sermon Lane and an additional small length of land in front of the opposite building. I like the fact that names are retained, however it is deceiving that the name looks to be in the right place (it is a court shaped stub of land off Knightrider Street) but in reality it is in the wrong place. This is the view looking down Knightrider Street. 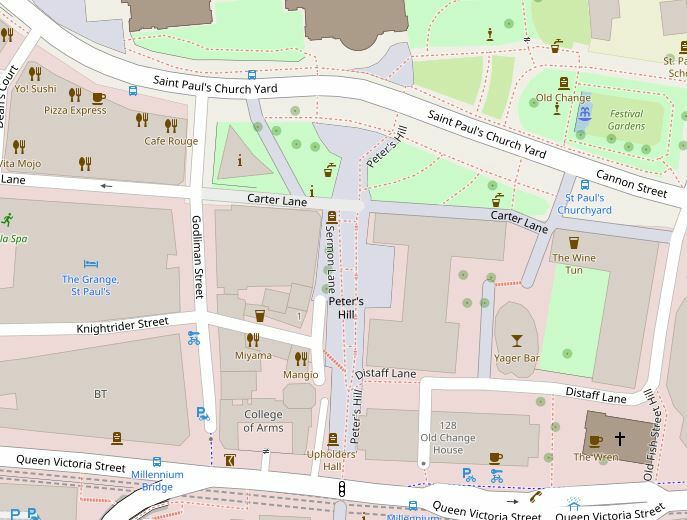 As can be seen in the maps at the start of this post, Knightrider Street once continued on towards Friday Street, however Peter’s Hill now terminates the street. 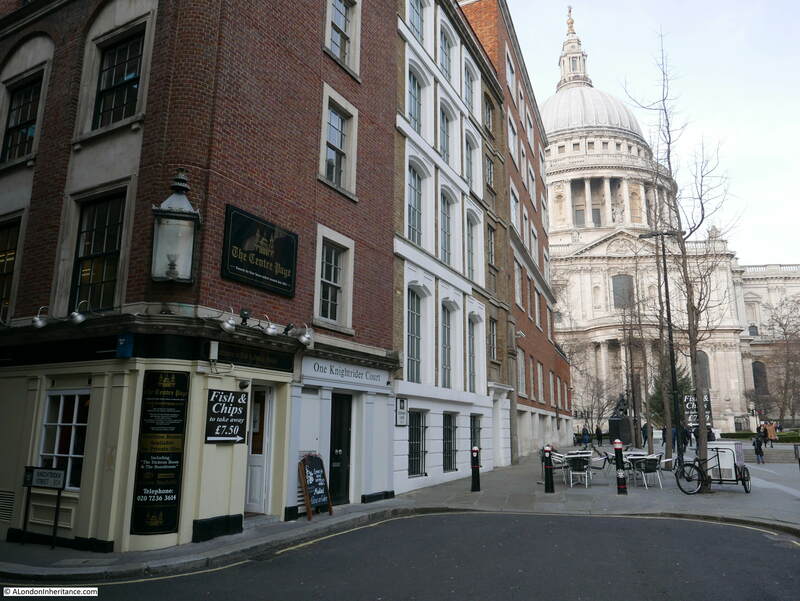 I explored the extension of Knightrider Street, past the church of St. Nicholas Cole Abbey in an earlier post: Distaff Lane – How London Streets Have Changed Over The Centuries, which also covers how the streets have changed in the area to the south of St. Paul’s Cathedral. I would be really interested to know why the Horn Tavern’s name was changed to the Centre Page. I would have thought that retaining such a historic name would have been a good commercial decision. It would also be great to see the light with the name of the pub once again etched into whitened glass and shining on a cold London night. This entry was posted in London Pubs, London Streets and tagged Horn Tavern, Knightrider Street, London Pubs, Sermon Lane, St. Paul's Cathedral on February 11, 2018 by admin.